With RPM Pro you can send UNLIMITED amounts of emails! Here you can view all of its great features! Send Leases, Invoices & more! With RPM Pro you can create and send UNLIMITED amounts of emails to all accounts on the software! 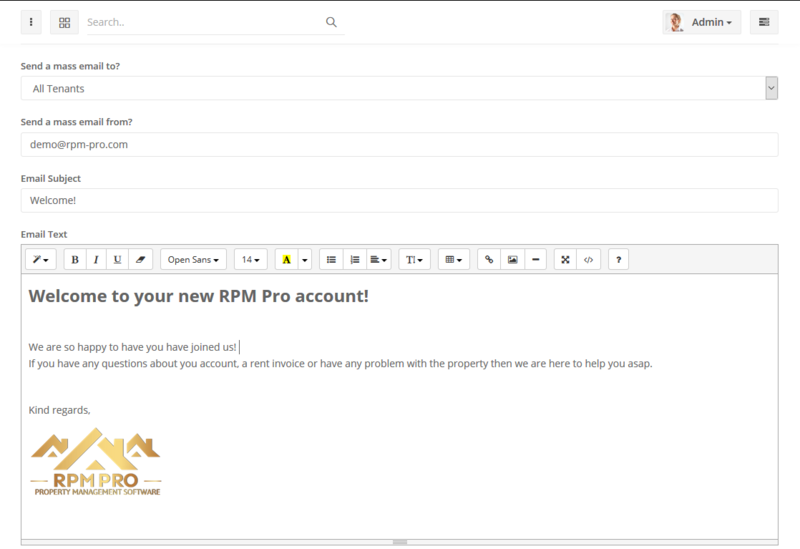 Sending an email from RPM Pro just like sending any other email but you don't have to login in to your email seperatly. You can easily send a quick and secure message to each account user on the software 24 hours a day! With RPM Pro you can send mass emails and other documents at the SAME TIME! With the mass email you can send a single email to multiple people. 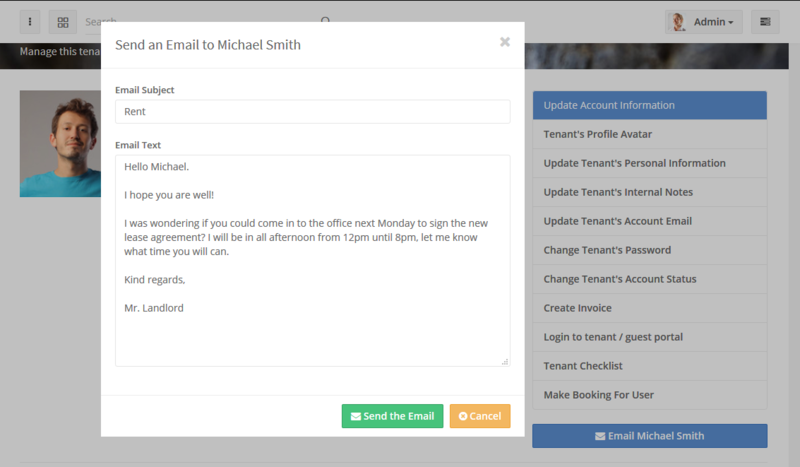 You can choose to send the same email to all admins, landlords, tenants, guests, housekeepers or service technichians. You also have full customization over your emails. RPM Pro goes even further than just private and mass email! With the automatic email system, you as the admin or/and landlord, will receive automatic emails when an automatic housekeeping request has been created (this happens when a booking has been made). You will also get instant emails when a service request has been filed which contains the description, property name and status. 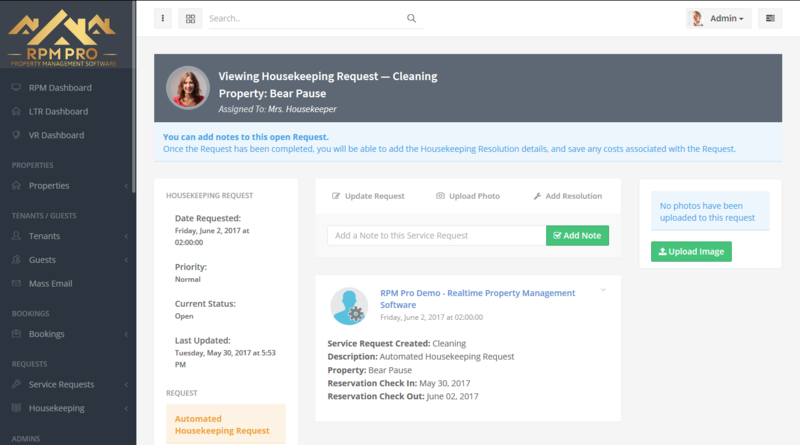 When you have assigned the request to maintenance account an email will automatically be sent to the assigned person providing them with full information of the request, the scheduled dates and what property it is. 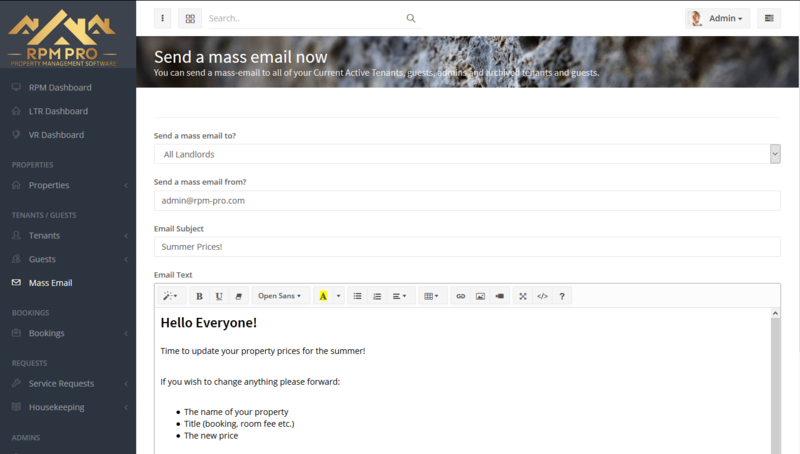 With RPM Pro you can customize your emails with the wysiwg (what you see is what you get) editor! Choose between multiple different font styles, headers and text sizes, front and background colours, add pictures and logos, coloumns and lists, insert links and file URLs, create tables and more!